My first experiences with Android were with a Network media Player box without any touch screen and it seemed like going back to the dark ages prior to Windows 95 after using Linux for many years but it did allow me to do most of what I wanted. The basic nature of the Apps available at the time was a real surprise when Android is used extensively on Tablets and even high level phones have far more computing power than my netbook. Fortunately the situation has improved considerably now with, for example, Android versions of Firefox, Opera and VLC now being available and Office suits such as WPS offering good viewing with some editing of Microsoft Offfice compatible files. The biggest problem one finds is that Android severely restricts the use of external storage by Applications and much of and additional memory is only available read only to user applications so, for example, one sets up an application which is capable of lossless rotating of old images which are on their sides but then one finds it can only work on the very limited internal memory so one is faced with using the internal file manager to copy files to the internal storage (4 Gbytes but only a part is available) viewing and rotating then copying back onto the hard drive. The restrictions vary with Android version but the KitKat 4.4.2 on most of our machines has the greatest restrictions and many users are finding programs they were using fail after the system is upgraded. As time has gone on we have gained a number of pads and phones with touch screens and I have gradually learnt more about the interface and various tricks so I have warmed much more to it. That said most of the best interfaces and functionallity come from the Pre loaded apps on our Samsung machines and generic machines seem very basic even after loading apps which seem to mimic the missing functionality over the Samsung machines. The big advantage of the generic machines over Samsung is in interfaces where the functionality has been castrated by Samsung for USB input and output and there is no HDMI output at all. In exchange the Samsung machines both have excellent battery life. My first Android device (in 2012) was a Generic Android 4.2.2 Network Media Player with Dual Core Processor, HDMI output, 4 USB sockets and a simple remote from 7Dayshop.com. It has a SD card slot and also allows me to plug in a 640 Gbyte USB 3.5 inch drive which has all my music, all my pictures including 'print files' from the last 10 years and most of my old videos transferred from VHS tapes and some 200 Video8 tapes from my camcorders up to 2000 when I went digital. For under £45 this is an exception bit of kit, especially when used with an external mouse and preferably keyboard and plugs straight into a HDMI input on a monitor or TV. It has its own sound output but my HDMI monitor has a headphone output which seems to give less interference and better sound. Using Android without a touch screen seemed like going back to the dark ages prior to Windows 95 after using Linux for many years. Adding the remote mouse helped and it does allow me to do most of what I wanted with Media and learn about using android and its strengths and weaknesses before investing more heavily. I referreded above to restrictions user downloaded apps have in external memory access. One of the Apps I have been using to display pictures sorts the pictures on file creation time rather than the Exif data and but supposedly has the ability to change the creation dates to match the Exif data (camera shooting time). However I find it can not write them to the hard drive unless one copies them to and from the local memory in the file manager - duh. I found a simple command line program which does it on my Linux machines in a couple of minutes so it is quicker to move the hard drive and do the whole 50 Gbytes than mess around for even a couple of folders. You can however run several programs at a time so I can set some music playing then start the Pictures displaying but changing the volume even with the remote stops the slide show. Android obviously handles email in phones and tablets but again it was a trip down memory lane. Few email apps in 2012 would even display html mail and it seems only two (which are not free) can write html mail. I suspect most people are driven to web mail. On the good side contacts do get automatically synchronised if you have gmail account which is almost manditory to even download your apps from 'Google Play', the source of 'approved' apps, even the name is a give away to the level of sophistication Google offers in Android. I have set up Inomail on the box which is not bad and handles html mail (even writes it if you pay £3.00) and the integrates and synchronises gmail contacts. The system does not properly synchronise calendars so I had to use the web version of google contacts at present on the box but it is looking more like a simplistic but workable set up. This seemed to be a google rather than android box problem and got fixed. Certainly the calendar and email sync on the other machines is now excellent and the Samsung programs are well thought out for small screens. I never not got network file sharing working on the media box. I installed Samba Filesharing but there there seems to be a fundamental problem as Android seems to block ports below 1000 so SSH and other file sharing requires non standard ports on unrooted machines. QuickPic for Picture Slideshows - does what is required and would be good on mobile as it can do reasonable editing but not on external drives. JpegTool for lossless rotation of Jpeg files - simple but specialised but limited to internal media. Firefox Browser - not default browser as I am using built in browser which is a chrome varient in preference to Chrome or Firefox. Synker - part of my attempts to get calendar synchronisation working and a useful diagnostic but probably not required full time as a tool. Root checker - used to make sure the Box was not rooted; some are. Samba Filesharing - failed to get samba working so far - looks as if rooting is required. VLC Player - in Beta and well worth investigation judging by the Linux version. This proved to be a very different story to the NMP box and almost everything we needed worked out of the box. This improvemmnt is partly because the basic built- in Android programs have improved in the last year but also a large number have been enhanced by Samsung for their phones and tablets. For example the built in Gmail, Email, Calendar and Contacts apps are perfectly adequate and work out of the box for Gmail, POP mail, Google Contacts and Google Calendars which all syncronise with Thunderbird and my Blackberry. The Samsung Tab 3 is light (300 gms) and has exceptional battery life, it can be running in the background for days and has a good ten hours of in use with screen on. There is a built in GPS which is not very sensitive and is slow to obtain lock but even so proved very useful during our time in Holland. The Samsung Tab 3 however does have severe shortfalls when it comes to interfaces. The major shortfall is that it only has a single microUSB connection, primarily used for charging, which does not implement OTG. USB On-The-Go , often abbreviated to just OTG, is a specification first used in late 2001, that allows USB devices such as digital audio players, mobile phones and tablets to act as a host, allowing other USB devices like a USB flash drive, digital camera, mouse, or keyboard to be attached to them. Use of USB OTG allows these devices to switch back and forth between the roles of host and client devices. For instance, a tablet may utilise an external USB keyboard or read from removable media when acting as the host device, yet present itself as a USB Mass Storage Device when connected to a computer. In other words, OTG introduces the concept that devices can perform both master and slave roles – whenever two USB devices are connected and one of them is an OTG device, they establish a communications link. Whichever device controls that link is called the master or host, while the other is called the slave or peripheral. The microUSB connector on the Samsung has another problem in that it does not implement the USB Mass Storage file transfer system which is used by most devices such as cameras, media players and earlier Android devices. This is not unique to Samsung - since Honeycomb, Android devices have by default, starting using MTP (Media Transfer Protocol) instead of USB Mass Storage file transfer. Arguably there were good reasons to swap but the support in hosts has been so patchy that it is still a major problem. The problem with a USB mass-storage device is that it operates at the granularity of a mass storage device block, rather than at the logical file level. In other words, the USB mass storage class gives a host computer undifferentiated access to bulk mass storage, such as compact flash, rather than to a file system, which might be safely shared with the target device. In practice, therefore, when a USB host computer has mounted an MSC partition, it assumes absolute control of the storage, which then may not be safely modified by the device without risk of data corruption until the host computer has disconnected. In contrast USB Mass Storage uses a block-level protocol which means is that a partition can not be mounted on two different systems at the same time. Each partition that needs to be mounted on a host computer must first be unmounted from the device. This is impossible on a device with only a single partition, since if the system partition was unmounted, the device would crash. To work around this issue, the first Android phones either had two partitions in the internal memory or had a microSD slot. Phones with microSD slots would just provide access to the microSD card partitions to the connected computer. When MTP is used this restriction is lifted with the associated advantages of a single partition allowing flexible distribution between application and other data. However MTP access is much less flexible as the main purpose of this protocol was to only allow the transfer of media files and associated metadata to and from portable devices, one transfer function, in or out, at a time. Productive activities such as open, edit and modify require copying the whole file to the hosting system for these functions then copying back in their entirety to change the data. We are primarily interested in access from Linux and versions of Ubuntu and Linux Mint have some built in MTP support - see webupd8.org for earlier versions of Ubuntu/Mint. On connecting to my machines running Mint 17 I get the occasional error message but generally it mounts. On the pad I get a little USB symbol in the top right corner of the notification area and if one swipes down there is a notification one can tap to chose the USB interface options. Chose Media Device (MTP) details and screenshots follow. and tap the select and a Nemo (file manager) window should open on the computer if it has not already showing an additional device 'Samsung Android' with folders 'Tablet' and 'Card' which correspond to Sdcard0 and extSdCard. The MTP and PTP Interfaces do not always seem to be very reliable and I have started to make use of Airdroid to transfer files. Airdroid is a very flexible piece of software and allows one to access many features on our Android devices via Wi-Fi and a Browser interface on any computer or even another Android device. It works over your local network or even by a Wi-Fi tethering Hotspot on the Android machine if Wi-Fi is not available (I believe a USB orBluetooth link is also possible). It becomes even more flexible if you use their web site for 'login' and lost phones can be found etc., but I have only tried the 'Lite' features so far which do not require any 'cloud' connectivity. I will write it up more fully but my experiences so far show it to be a very flexible and easy to use way to transfer files and access TXTs. The screenshots taken above use the built in Android function activated by the combination of Home and Power keys until thee screen shakes. On other machines the Volume Down and Power key combination is more common. Bluetooth seems to work very easily on the Samsung. Initially I only tested with the BTR006 audio receiver which paired easily and the music output switches automatically when Bluetooth is on. 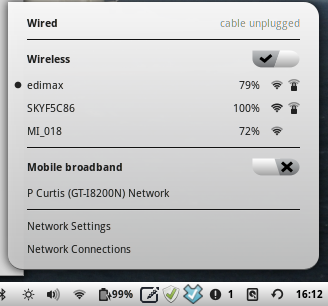 More recently I have made internet connections via Bluetooth tethering from an Android phone, again very simple - see below. The Samsung Tablet has received an operating system upgrade automatically downloaded from Samsung from 4.1 to 4.2 Jellybean just before the phone received an update from 4.2.2 to 4.4.2 Kitkat, both of which caused no problems. Sumvision Cyclone Voyager II Quad Core processor (16 Gbytes). The Sumvision Cyclone Voyager II Quad Core bought from 7dayshop is a much less refined machine than the Samsung Galaxy Tab 3 7" in many ways but is also much cheaper especially from (£69 v £116), has more flexible interfaces, has, in theory, a much more powerful processor, but all at the expense of battery life. It is also significantly heavier (355gms v 300 gms) and has a smaller display area on the screen as it uses software 'buttons' at the bottom of the screen. The software buttons are however much more flexible and arguably easier to use and as they re-orient with the device rotation and are reprogrammed with context. Keyboard - SwiftKey - As good as or better than the Samsung keyboard and more programmable but misses the 'killer feature' of an integrated multiple clipboard. Power management - Battery Doctor - This makes a difference but can not compensate for the smaller battery (3000 versus 5000 ma/hr) and power hungry processor. Multi Clipboard - Clipper - more flexible than the clipboard in the Samsung keyboard but slower to use. Music Player - Winamp - the future of Winamp is uncertain but it was the best of the free bunch at the time. I bought a Sumvision keyboard and case at the same time as the Cyclone Voyager II which works well with it, however I also like some of the features of the inbuilt keyboard and to be able to rotate to a portrait view so it is often unplugged. The keyboard, as expected does not work with the Samsung because of the lack of OTG covered above. GPS Essentials - gives information on satellites in view, in use etc as well as lots of other really useful stuff. I checked both the Samsung and the Sumvision had good connections by transfering most of my music collection (10 Gbytes) directly from one to the other. The average speed showed as 3.8 Mbytes/sec and the transfer took ~40 minutes. The battery did not seem to go down much (max 3%) on the Cyclone so it is possible it keeps topped up although it did not show as charging - otherwise it must use very little with the screen off. The Samsung gained 5% charge whilst on the cable as one would expect a slow rate. I have purchased a 7dayshop RPB52 Universal Portable Backup Power Pack 5000mah and a 7dayshop DC 2.5mm to USB 2.0 High Speed Charging Cable for Bluetooth Receiver / Transmitter & More so I can recharge the Sumvision when away from a mains supply - the battery life is so bad it is essential and I have ended up buying a second pack. I also bought a LMS Data Gold Plated HDMI to Mini HDMI Digital / Audio Cable - 1.8m to test the HDMI output which worked perfectly for Sound and Picture on my LG Monitor. I bought and fitted a 32 Gbyte Kingston microSD card. I also have dual OTG microUSB and standard USB 32 Gbyte minature dongle for transfers and Music. We now have two Android phones, a Samsung Galaxy S3 Mini and a Samsung Galaxy S3 Neo. The S3 Mini runs Android 4.2 and the S3 Neo Android 4.4 but otherwise they are very similar. Both were older models reissued at very reduced prices when we bought them but both are are still perfectly adequate and run everything we need at a good speed. They both have similar software installed to the Samsung Galaxy Tab 3 , the only difference being that we do not use the S3 Mini for email and rarely for browsing whilst the S3 Neo is used for browsing a lot as it has a very high resolution 4.7" screen. The S3 is also often used to reply to emails when a quick response is adequate. One of the most important attributes of Android phones is that they are very easy to set up for tethering which allows connection of other devices to the internet via the mobile connection on the phone and Wi-Fi. When tethering the the mobile phone is turned into a mobile hotspot and the Wi-Fi connection is it is protected by a WPA connection and password. You can also set it up to only allow certain devices to connect dependent on their MAC code so you are very secure. Although it is simple there are a few useful tricks which it is as well to know when setting up and when using from another Android device to control the use of data. Most Android devices can be set to only update when connected to Wi-Fi so you need to tell them that although you are connecting via Wi-Fi it is actually a mobile connection so they should not use it for updates etc. Tip: You can do all the setting up of tethering without having Mobile Data turned on including the Wi-Fi connection from each device you will use. This means that you can do all your set up and put your restrictions in place without risk of vast amounts of data being accidentally used. Setting up the Quick Settings Buttons to optimise use of Power and Data and give quick access to Tethering: There are always many ways to setup Android devices but fortunately they are fairly standard between versions. I find the best way to control Tethering on a regular basis is from the 'roll down' Notification Panel and use of Quick Settings Buttons which are across the top of the notification area. You may need to add the Tethering Button (Often called 'Wi-Fi Hotspot') it and position it where you want. The Quick Settings Buttons are configured from Settings -> My Device -> Display -> Notification Panel which contains sufficient help to add and reorder the quick settings buttons. I like to have Wi-Fi, Mobile Data, Wi-Fi Hotspot, Sound and Flight Mode visible without scrolling as these control the most important usage of power and data. The others I have accessible by scrolling are Bluetooth, GPS, Power Saving and Sync. Settings can also be accessed from the top right of the Notification Panel. Wi-Fi Hotspot Configuration: The final setup of a Hotspot is now trivial. Turn off Mobile Broadband and Wi-Fi and Turn on Wi-Fi Hotspot using the Quick Settings Buttons. You will now have an entry in the Notification panel saying 'Tethering or hotspot active Tap to configure' - Tap and you will at the Tethering and portable hotspots configuratiion screen (Also Accessible by Settings -> More Networks -> Tethering and portable H#hotspots). Tap Portable Wi-Fi hotspots and then Configure to give a meanimgfull SSID, leave security as WPA2, provide a memorable password and Save. That is all you need to do unless you want to restrict access to allowed devices which you can only do easily when they are connected. Now when you want to use the Hotspot you just turn it on and turn on Mobile Data using the Quick Settings Buttons in a few seconds and kill it just as quickly. You can connect to a Mobile Hotspot as your would any other Wi-Fi point from your other machines but remember it is easy to use expensive mobile data very fast on 3G or higher and get a big bill. On Computers and Laptops make sure all automatic updates are turned off and other potentially data hungry applications such as Skype and Dropbox are not running. Have a look in the Startup Applications and turn off autostart on everything which is not essential which may consume data. Likewise turn off automatic email collection and other syncronisations - carry them out manually. Some programs such as Firefox may update add-ons automatically so be vigilant. A Usage Monitor such as NUMA is desirable with an automatic switch off option when a data limit is exceeded and monitor your normal usage for a few days before using a mobile hotspot. Connecting an Android Device to the Hotspot: Most Android devices can be set to only carry out automatic updates when connected to Wi-Fi so you need to tell them that although you are connecting via Wi-Fi it is actually a mobile connection so they should not use it for updates etc. However you need to make the initial Wi-Fi connection before you can mark it as a mobile connection. Fortunately you can however make the initial connection whilst your Mobile hotspot is enabled but with Mobile Data Off on the Tethering Device so you are safe. Once the connection is made in the usual way you can turn off your Mobile hotspot again before proceeding. This setting you are looking for on the tethered device is in an obscure location and you need to have Wi-Fi on but it does not need to be connected to anything. Go to Settings -> Connections -> Data usage -> Menu (bottom left button below screen on Samsung devices) -> Mobile hotspots - You now have a list of all your Wi-Fi connections and can tick boxes for for those that should be considered as mobile hotspots. You can also tick the Restrict Background Data from this menu but I rarely use that feature as just marking the wi-Fi connection as a Mobile hotspot seems to be sufficient. With five android phones, tablets and other machines now in our hands much of this write up will now be common to all the machines. In practice the Samsung Galaxy Tablet and Phones are used all the time and what follows is mostly appropriate to them. Encryption - Vera/TrueCrypt and Android implementations. Encrypts automatically, real-time (on-the-fly) and transparently. Uses the best of strong encryption algorithms. Conceived in 2003 - had a strong support team until suddenly terminated in 2014 at version 7.1a. Supported by Steve Gibson, a security guru who led me to ZoneAlarm. Forked into VeraCrypt with even higher security and also has a strong support team. We use the VeraCrypt facility to create a Virtual Disk with the contents encrypted into a single file or onto a disk partition or removable media such as a USB stick. The encryption is all on the fly so you have a file, you mount it as a disk and from then on it is used just like a real disk and everything is decrypted and re-encrypted invisibly in real time. The virtual Drive is unmounted automatically at close down and one should have closed all the open documents using the Virtual Drive by that point just like when you shut down normally. The advantage is that you never have the files copied onto a real disk so there are no shadows or temporary files left behind and one does not have to do a secure delete. I have had it loaded it onto all my Windows and Linux systems. Truecrypt obviously installs deep into the operating system in order to encrypt decrypt invisibly on the fly. Making new volumes (encrypted containers) is now trivial – just use the wizard. One has to have administrative privileges to mount ones volumes and under Linux this means that one is asked for ones administrative password on occasions as well as the volume password when the Truecrypt volume is mounted. Truecrypt has now been withdrawn under rather odd circumstances by its original writers but it has now been forked and development and support continues as VeraCrypt. There are a couple of options to open Vera/TrueCrypt containers on the go using an Android device. Cryptonite is in some ways the more elegant solution but unfortunately it requires the device to be rooted in order to handle TrueCrypt files. For those who don’t want root their devices, there is EDS (Encrypted Data Store). I have used EDS Lite on my earlier Android devices (Android 4.4 Kitcat) with TrueCrypt containers. I have, as yet, not used VeraCrypt containers as I have not converted the container formats on any of my machines. I have not used on my Tab S2 with Android 7. Use the SHA-512, RIPEMD-160, or Whirlpool Hash Algorithms. There are inbuilt restrictions in Android, dependent on the version, on where files can be mounted read/write. EDS Lite can create Vera/Truecrypt compatible vaults (containers), display the 'linked' containers, open them and display the contents in a File explorer which can also display normal files and launch applications. If the file is not in the container or the container is mounted then the file's default viewer will be launched. If the file is in the container and it has media type extension then it will be played in the default media player. If the file is in the container and it is not a media file then it will be copied to the EDS application folder (which is located on the sd card) and then the file's default viewer will be launched. If the file is changed on the sd card the program will try to copy this file back to the container. The temporary file will be overwritten with random data and then deleted from the sd card after the container is closed. You can change the maximum size of a file, that can be started this way, in the program settings. This mode of operation is not as good as full 'on-the-fly' encryption and decryption as there will be times when the temporary file is availabe unencrypted and it also depends on how well it is overwritten, it should involve multiple overwrites with random data for complete security. The full EDS can do 'on-the-fly' encryption and decryption but only on 'rooted' machines. In practice the process of viewing and editing encrypted files from a Vera/TrueCrypt Vault is quite practical and is done within EDS Lite. For the most part EDS Lite worked out of the box although the interface is however not completely intuitive or consistent with other apps, but few are! The one major problem I found when I installed it on the Samsung Galaxy S 3 Mini smartphone was that it initially froze the complete machine when I came to open one of my 5 Mbyte vaults. I compaired the settings to those on the tablet and found that Maximum Temporary File Size was lower on the freezing machine and increasing it to twice the size of the vault file solved the problem ie from 5 to 10. This is reached from the Android Settings Menu -> Settings which gives a long EDS Main Settings screen which you will have to move down to find Maximum Temporary File Size it is not obvious why this has to be increased as the folder should be able to be opened in read write mode but it worked. I do not recall doing it on the other machines. It seems unreliable even after this change on the S III Mini and I have also tried reloading. At present it is unusable without a change in its settings before opening a file - very odd. Dropbox works somewhat differently on a mobile device to on a computer. On computers one has a folder (Called Dropbox in your home folder under Linux) which is syncronised to the Dropbox in the Cloud and then syncronised with similar folders on PCs running Linux, Windows or on Apple computers. As soon as a file has been changed it is uploaded and other machines have it available and are downloading almost immediately. This would provide an unacceptably large data flow for mobile devices so only the file names are available on mobile devices and they are downloaded for use on demand when an appropriate application is available. They can also be stored locally if they are marked as favourites for offline use. The only major exception is with ones pictures which can beuploaded automatically with an option to hold upload until a Wi-Fi connection is available. This means that it is difficult to keep even small files continuously and automatically in syncronisation as is desirable for a Vera/TrueCrypt Container. Full two-way sync with Android mobile devices - just like Dropbox on real computers. Efficiency, consumes almost no battery if there is no change detected and does not slow down the mobile device. Multiple sync modes. Not only two-way, you can also choose Upload only, Upload then delete, Download only, Download mirror etc. Note: Dropbox needs to be installed and an account set up before Dropsync can be used. Dropsync, once set up gives us a home for one or more Truecrypt type containers (Vaults) which can be used to keep encrypted information in sync between many computers and mobile devices. In the free version these are limited to 8 Mbytes each. There may be the occassional conflict if there are several users who change files frequently and do not close the Vaults when they are not in use but no more than with Dropbox. It is prudent to do a manual sync if you have chosen a long autosync interval or if the automatic upload conditions are not met (eg a low battery). Summary of accessing and modifying a shared encrypted document. This is what I have writen for Pauline on how to access and possibly edit an encrypted document on an Android pad. First make sure that the 'Vaults' aka Vera/Truecrypt Containers are up to date by running Dropsync if there is any chance that any have been modified since the last syncronisation - Dropsync should start with a screen which has the usual syncronisation symbol in the top bar. You do not need to close it afterwards. The EDS entry screen should show all the 'Vaults' that have been pinned ready for use. Tap the one you want. Enter the password using the on-screen keyboard then tap the button in the box. The display should now be in browser mode showing all the files in the Vault. The file should now be open and can be edited. When you have finished editing then just Save which should update the file in the vault and wipe any temporary unencrypted files by repeated overwriting. DO NOT Save As or you can not get the changed file back into the vault. You should now be in or you should get back into EDS and the files in the vault should still be displayed. You need to get up a level using the pads back button or the icon in the top panel. You now need to tap and hold on the entry for the open vault (an open padlock icon) - this will produce a menu and you should tap close. You can now leave EDS if you want by the back on the pad. If the battery is up then Dropsync should automatically syncronise and upload the changed Vault - you will see in the notifications - otherwise do it manually. That sounds long but it takes me under a minute in and to get to view a file with the main time being carefully entering a pass phrase on a small onscreen keypad. This proved to be very easy and provides access to the internet via an Android smart phone - in my case either a Samsung S3 Mini (GT-I8200N) with Android 4.2.2 or a Samsung S3 (GT-I9301I) with Android 4.4.2) although this should work with most phones and equal or higher versions of Android. The phone needs an active internet connection which can be a mobile phone connection with Data enabled or a Wifi connection. One might ask why bother in the case of a wifi connection, why not connect directly? It has obvious advantages if you are on a 'pay by time' connection as you can connect several machines as well as the phone and it also gives extra security in an internet cafe. In may cases the phone can be set up to log in automatically to a Sky or similar Wifi connection. On Computer with Mint 17: Menu -> Bluetooth -> + (Add Device) -> GT-I8200N (or your phone) -> Follow instructions on Phone and Computer to pair by accepting or entering the 6 digit numbers. On Computer: You are now paired and should still have a screen which has a box marked 'Use your phone as a network device (PAN/NAP) which should be ticked, if not tick it. Not needed in Mint 18 as it is automatically enabled. That is basically it - when you click on the network manager applet in the panel you should have an extra heading Mobile Broadband with the new connection GT-I8200N under it. The pairing is slightly different in Mint 18 - you have to accept the confirm the number provided on Both machines and the button is very small at top right on the computer. You settings screen is also greatly simplified and you no longer need to explicitly tick a box to use with the network manager, it is done automatically and it shows in Network manager as above. Untick Bluetooth tethering box and/or turning off Bluetooth on the phone is safest way. There is no quick links in the notification panel on the Android phone under 4.2.2 for switching tethering on and off but you can add a Settings widget to the home screen to take you straight to the tethering settings. 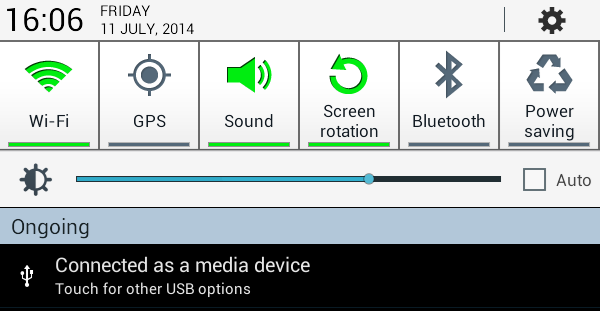 Android 4.4.2 has a link on the notification panel and a long hold takes you to the full tethering settings. Note that you can use data very fast from a computer especially if there are automatic upgrades etc. Experiment with a Wifi connection on the phone first and use a data monitoring applet such as NUMA. Check data use frequently on the Phone. The Android Bluetooth tethered connection uses a Personal Area Network (PAN) which is a computer network used for data transmission among devices such as computers, telephones and personal digital assistants. PANs can be used for communication among the personal devices themselves or for connecting to a higher level network and the Internet. A Bluetooth PAN is composed of up to 8 active devices in a master-slave relationship (a very large number of devices can be connected in "parked" mode). The first Bluetooth device is the master or in this case the Network Access Point (NAP), and all other devices are slaves that communicate with the master. The communication protocol is the Bluetooth Network Encapsulation Protocol (BNEP) which is used to transport common networking protocols over the Bluetooth media such as IPv4 and IPv6. The packet format is based on Ethernet. More on Using Bluetooth Tethering from Linux Mint 17.x and 18.x or Ubuntu. 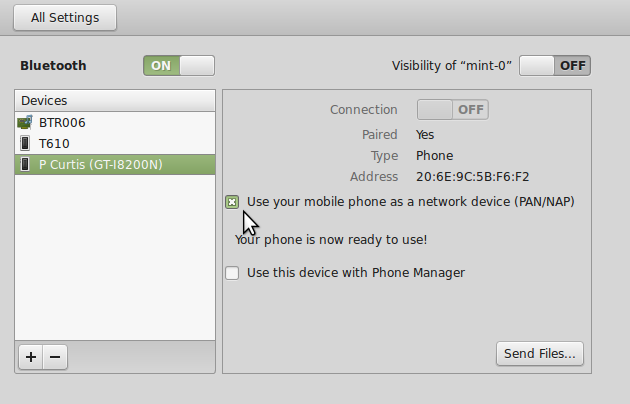 In Linux Mint the Bluetooth Manager detects that the Android device supports PAN/NAP when you pair and, by ticking the box, creates a connection for the Network Manager. The Network Manager (in the form of the applet) makes this available but the support is incomplete. As mentioned above one easily ends up with duplicate connection which have to be deleted from the terminal as root. The connection is also identified by the Bluetooth address and it delivers this rather than the actual connection interface which is bnep0 and is displayed as a Mobile Broadband Connection which is an approximation to the truth! This causes a problem with my NUMA applet which depends on the interface delivered by the Network Manager so I have had to add an exception as I have with the ppp0 interfaces used by Mobile Broadband connection. Airdroid is a very flexible piece of software and allows one to access many features on our Android devices via Wi-Fi and a Browser interface on any computer or even another Android device. It works over ones local network when at home or by a Wi-Fi tethering Hotspot on the Android machine if Wi-Fi is not available (I believe a USB orBluetooth link is also possible but I have not investigated). It becomes even more flexible if you use their web site for 'login' and lost phones can be found etc., but I have only tried the 'Lite' features so far which do not require any 'cloud' connectivity. My initial experiences show it to be a very flexible and easy to use way to transfer files and access or send TXTs from a Computer. Overall Airdroid is a very convenient way of moving files to and from the Phone without the inconvenience of USB cables and gets round the current unreliability of the USB connections using MTP and PTP protocols from Linux. How to use AirDroid without Wi-Fi or other network connection? Create a Wi-Fi hotspot on your Android device. The detailed steps may vary for different devices, but should be similar to this: Go to Settings > Wireless & networks > More > Tethering & portable hotspot and enable Portable Wi-Fi hotspot. Open AirDroid on your device, tap Tethering. A new AirDroid url like “http://192.168.43.1:8888” will be displayed. I have been very impressed with the ease of use of Skype on the two phones and the tablet - it works as one would hope out of the box both in the conventional way with or without video and also the use of Skype credit to call conventional landlines and mobiles very cheaply anywhere in the world. Skypeout is sufficiently intergrated that it is easy to use your normal address book. Finding and adding Skype contacts also seems much easier than it used to be. It would be nice if there was a way to sort your Skype contacts so it showed those on line. My Definitions of Desirable and Essential are themselves somewhat moving feasts and also depend on the devices. For example a combination of the Galaxy S3 Mini phone and Galaxy S3 7" Tablet can together satisfy the essential requirements whilst the small phone alone would be inapropriate because of screen size whilst the S3 Neo with a 4.8" 1280x720 display can do everything that counts as essential by itself although the larger keyboard on the tablet is better for bulk text entry. Internet - Android browser, Preloaded Samsung Internet and downloaded Chrome Browser. Firefox is currently my favourite but I also have Opera available. Google Contacts or Samsung Contacts. Google Calendar or Samsung Calendar. Picture Slideshows - QuickPic for Picture Slideshows - does what is required and would be good on mobile as it can do reasonable editing but not on external drives. Office Functionality - WPS Office is much better than 'Docs to Go' or Polaris Office (Preloaded on Samsung). One is looking for good viewer with at least some limited editing. Vera/Truecrypt Encryption of files - EDS Lite - no longer so essential now we use use a good secure password manager. Hackers Keyboard - Provides a 'full' onscreen keyboard with navigation keys etc for coding. I have grouped these together as the first thing one needs to do when one has aproblem is to back up anything vaulable! Turn the Device on and off or restart. Do a Cold Boot by either holding the Powerkey for about ten seconds or better still take the battery out for say 15 seconds. Start in safe mode ie without any apps you have loaded. Remove the memory card - this may mean checking you do not have any applications which are loaded onto. Check in the application manager and move them back. Back everything up and do a system reset taking one back to an out of box state - this is the last resort before returning to the shop or buying a new device! This follows the proceedure on the Samsung web site. Reboot or switch on the phone and wait until the Samsung Logo animation appears, and then keep pressing the menu key ie the key at bottom right of phone, see below. If you have successfully entered into Safe Mode, you will notice the text ‘Safe Mode’ at the bottom left corner of the screen. To return to normal mode, please turn off the phone normally and turn it on again. This is more demanding and hence risky as one has to boot into Recovery Mode first. The system cache stores the data that helps Android to launch your apps faster, but the larger it grows, the more CPU/RAM resources it requires. Wiping the system cache can drastically improve the responsiveness of your device. It is recommended that you purge the system cache after major system updates as it may contain obsolete app data which is why it is high on the list of things to try if you have an Android problem. Use the [Volume Up]/[Volume Down] keys to move through the menu items and select Wipe Cache Partition. Once the system cache has been cleared, Android will display a message that reads "Wipe Cache Complete". Conclusions - How does it all fit together, or why have an Android tablet and/or switch to an Android phone? This addresses our thinking now we have experience of using a mix of Phones, Tablets, Netbooks and Laptops for mobile computing so we can develop a strategy for the future. We first looked at Pads when Pauline started complaining that her old MSI Wind U100 Netbook was getting very slow but could not see any way tablets could be a replacement - however we began to see other roles that they could play. This was followed by Pete having to help set up and explain the use of an iPad to John which again gave some more ideas. Finally it came down to a spur of the moment purchase in Guernsey, the Samsung Galaxy Tab 3 7" was on a very good special offer and well under our duty free limit so it seemed a good way to really see if one could be useful. We had already laid out a list of things which would be needed to make a contribution to our existing collection of 'tools' for round the house and whilst travelling and the Galaxy seemed to make a good shot at many of them. The applications seemed to have come a long way since we got the android media box, certainly the preloaded and enhanced versions from Samsung and we could see a gap where it fitted between the excellent, always available email, contacts and diary through the Blackberry and the internet and office functions on the Netbook, especially for use in Wi-Fi Hotspots when one did not want the weight of a netbook to carry or the risks of being compromised. What we felt was needed was an enhancement of the functions of the Blackberry onto a screen capable of handling simple web browsing and basic office functions yet light to carry and cabable of lasting for long periods between charging. The netbooks/laptop also handles our music played through bluetooth, web authoring and as an image organizer and viewer and editor for digital photos from our cameras. A sensible target would be to extend the time away from a day with just a phone to a long weekend (or even a week) with a phone and pad with a saving of several kgs over a phone and netbook/laptop. The Samsung Galaxy S3 Neo has been a great success and handles Email well and is used for a surprising amount of web browsing with its 4.8"1280 x 720 screen, small but very clear. We have just added a Samsung Galaxy Tab S2 8" which is amazingly powerful and practical and a week or two without a laptop now seems very practical. I would be very pleased if visitors could spare a little time to give us some feedback - it is the only way we know who has visited the site, if it is useful and how we should develop it's content and the techniques used. I would be delighted if you could send comments or just let me know you have visited by sending a quick Message.